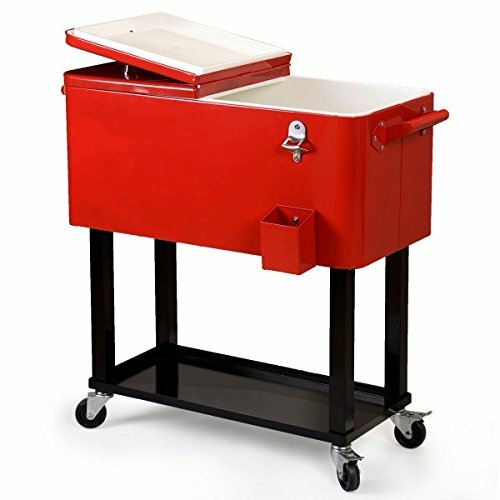 Outdoor cooler with cart holds 80 quarts, Steel body handles outdoor environment, Hardened powder coat finish, Insulated cooler body, Rear drain spout, Bottle opener and cap catch 2 fold back lids offer easy access from either side, Stainless steel and brass hardware. Features a hardened powder coat finish for years of splendor Has two locking casters for safety, Has a rear drain for easily clean up, Featuring refrigeration insulation,help keep your drinks cool for a longer duration. Material: Stainless steel, polyurethane, Handle/Cover:Chromeplate, Color: Red+Black. Overall Size: 33.5"x30.7"x15.2"/ 85(H)x78(L)x38.5(W), Basin Size:15.2"x30.7"x13.8"/38.5(W)x78(L)x35(H)cm, Tray: 27"x11.8"/69x30cm, Height:33.5"/85cm, Bottle-cap Catcher:4.7"x3.5"/12cm x 9cm, Wheel: 3". Hot design!! Sometime item will out of stock USA, we will direct ship from manufacturer for you. If you have any questions about this product by MasterPanel, contact us by completing and submitting the form below. If you are looking for a specif part number, please include it with your message.